Explanation: What would it be like to fly a space shuttle? Although the last of NASA's space shuttles has now been retired, it is still fun to contemplate sitting at the controls of one of the humanity's most sophisticated machines. Pictured above is the flight deck of Space Shuttle Endeavour, the youngest shuttle and the second to last ever launched. The numerous panels and displays allowed the computer-controlled orbiter to enter the top of Earth's atmosphere at greater than the speed of sound and -- just thirty minutes later -- land on a runway like an airplane. The retired space shuttles are now being sent to museums, with Endeavour being sent to California Space Center in Los Angeles, California, Atlantis to the Kennedy Space Center Visitor Complex on Merritt Island, Florida, and Discovery to the Udvar-Hazy Annex of the National Air and Space Museum in Chantilly, Virginia. Therefore sitting in a shuttle pilot's chair and personally contemplating the thrill of human space flight may actually be in your future. What a stupendous shot; kudos, Ben! When I read about launches of shuttles and rockets, there is always this implication that it is necessary to reach escape velocity as quickly as possible. I would assume, though that this is only necessary after you've run out of fuel. I'm guessing there would be an acceleration of optimum efficiency where the speeds you reach don't cause excessive drag from the atmosphere and once you've travelled the distance to leave the atmosphere, you can er thrust your rocket much more easily, if you will. At the top of the "Astronomy Picture of the Day" page it says "Each day a different image or photograph of our fascinating universe is featured, along with a brief explanation written by a professional astronomer". Today's picture is by a "Ben Cooper" who according to the link is a "freelance/media photographer". Perhaps this is why he did not realise that his picture is not astronomical? I suppose that "Astronomy" equal "Space" equals "Space Shuttle" is the sort of tenuous link that comes easily to media photographers. Maybe it is time to set-up an alternative site called "Terrestrial Picture of the Day" for those who do not like astronomical photographs. in order to avoid the combination of constantly fighting both drag and gravity. such that it expended a lot of fuel simply hovering above the ground barely moving at all. This is clearly not an acceleration of optimum efficiency. when the space craft is moving the fastest since Power = Force x velocity. However this can always be accomplished with multiple perigee burns over many different orbits. Last edited by neufer on Wed Apr 18, 2012 10:19 am, edited 2 times in total. MSP1 wrote: Maybe it is time to set-up an alternative site called "Terrestrial Picture of the Day" for those who do not like astronomical photographs. *we really need a 'dead horse' icon. Ben Cooper has a great shot of yesterday's Discovery ferrying here; there are other shots of Discovery's flight there, too. MSP1 wrote: At the top of the "Astronomy Picture of the Day" page it says "Each day a different image or photograph of our fascinating universe is featured, along with a brief explanation written by a professional astronomer". If I didn't already know that all your posts on Asterisk are complaints and that I and others have previously responded to your earlier posts, obviously in vain, I might be tempted to point out that you apparently don't quite understand how APOD works, that Ben Cooper submitted his image but is not the one who chose the image for today's APOD, that terrestrial images -- not that this is one of them -- have been well-received by the APOD-viewing public, and that there are plenty of places to see astronomical images, including on this very board, but I do know, so I won't. owlice wrote: Ben Cooper has a great shot of yesterday's Discovery ferrying here; there are other shots of Discovery's flight there, too. Indigo_Sunrise wrote: *we really need a 'dead horse' icon. Indigo, what a good idea! Will this do? Maybe tomorrows post could be a MOVIE of the Space Shuttle so we can see the the complaints about the subject and the format on the same day! Better to have old computers that work than new computers that really do BSOD. FloridaMike wrote: Maybe tomorrows post could be a MOVIE of the Space Shuttle so we can see the the complaints about the subject and the format on the same day! A movie about a mysterious streak over the arctic with global warming as the implied culprit explained by the Voynich Manuscript translated into QR code. APOD Robot wrote: What would it be like to fly a space shuttle? You can find out, sort of, for yourself. I have an app called F-Sim Shuttle on my iPad (there are other sim apps for both tablets and computers) which gives you a good feeling for how quickly the shuttle comes down. (It's been described as a flying brick.) Mostly what it's like, at least when I'm the pilot, is "Oops. Crash. Start over." It's really hard to land that thing! I didn't read where Endeavour will go; so i checked with Wiki! NASA offered the three remaining orbiters for museum donation once they are withdrawn from service. After more than twenty organizations submitted proposals to NASA for the display of an orbiter, NASA announced that Enterprise will go to New York's Intrepid Sea-Air-Space Museum, Discovery will go the Steven F. Udvar-Hazy Center of the National Air and Space Museum, Atlantis will remain in the Visitor Complex at Kennedy Space Center, and Endeavour will go to the California Science Center in Los Angeles. Endeavour's Canadarm will be removed and sent to a yet-to-be-determined museum in Canada, while the other two Canadarms will remain with the shuttles. Now, somebody, do it in Legos. 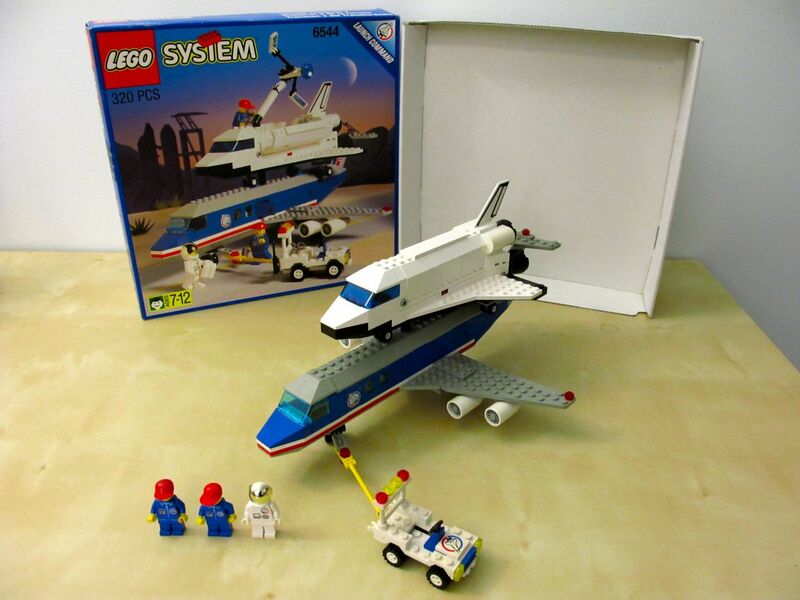 I had a lego space shuttle when I was young! It had the Canadarm and working bay doors... but you had to take the thing apart to fit a lego man inside. Did one even fit? I can't remember. <<Virgin Galactic has ordered two White Knight Twos. Together WK2 and SS2 form the basis for Virgin Galactic's fleet of suborbital spaceplanes. The Scaled Composites Model 348 White Knight Two (WK2) is a jet-powered cargo aircraft which will be used to launch the SpaceShipTwo spacecraft. It is being developed by Scaled Composites as the first stage of Tier 1b, a two-stage to suborbital-space manned launch system. WK2 is based on the successful mothership to SpaceShipOne, White Knight, which itself is based on Proteus. With an "open architecture" design and explicit plans for multi-purpose use, the aircraft could also operate as a zero-g aircraft for passenger training or microgravity science flights, handle missions in high-altitude testing more generally, or be used to launch payloads other than SpaceShipTwo. A study to look at using the aircraft as a forest fire water bomber has also been mentioned, one that would utilize a large carbon composite water tank that could be quickly replenished to make repeat runs over fires. As of November 2010, The Spaceship Company has announced that it plans to build at least three additional WhiteKnightTwo aircraft and an additional five SpaceShipTwo rocket planes. These are the aircraft to be built after the initial prototypes of each craft are built by Scaled Composites. Flase wrote: When I read about launches of shuttles and rockets, there is always this implication that it is necessary to reach escape velocity as quickly as possible. I would assume, though that this is only necessary after you've run out of fuel. The Space Shuttle isn't capable of achieving escape velocity. At its best, it can only achieve a low Earth orbit. The change in gravity is minimal between the surface and orbital height, so the goal of achieving orbital velocity before running out of fuel is best served by getting out of the denser low atmosphere quickly, since drag is a major source of energy loss. The actual profile is optimized based on many factors- the maximum stress the vehicle can stand (both in terms of acceleration and drag), the mass change due to fuel consumption, the insertion inclination (typically for the ISS, but occasionally different for satellite servicing), etc. <<Flogging a dead horse (alternatively beating a dead horse in some parts of the Anglophone world) is an idiom that means a particular request or line of conversation is already foreclosed or otherwise resolved, and any attempt to continue it is futile; or that to continue in any endeavour (physical, mental, etc.) is a waste of time as the outcome is already decided. The first recorded use of the expression with its modern meaning is by British politician and orator John Bright, referring to the Reform Act of 1867, which called for more democratic representation in Parliament, an issue about which Parliament was singularly apathetic. Trying to rouse Parliament from its apathy on the issue, he said in a speech, would be like trying to flog a dead horse to make it pull a load. The Oxford English Dictionary cites The Globe, 1872, as the earliest verifiable use of flogging a dead horse, where someone is said to have "rehearsed that [...] lively operation known as flogging a dead horse". A comparable expression for useless labour is "thrice to slay the slain", a quotation from John Dryden, in Alexander's Feast, stanza iv. Dryden drew his inspiration from Sophocles' Antigone in which the blind seer Tiresias is led onstage by a boy, and declaims, "Nay, allow the claim of the dead; stab not the fallen; what prowess is it to slay the slain anew?" The trope was used in Latin, too: in Libanius' funeral oration for the Emperor Julian, he declares of a scoundrel, "Of the three who had enriched themselves through murders, the first had gone over the whole world, accusing people falsely, and owed ten thousand deaths to both Europe and Asia; so that all who knew the fellow were sorry that it was not possible to slay the slain, and to do so thrice over, and yet oftener." The expression was used in "literary" contexts, as when Edward Young mused: "While snarlers strive with proud but fruitless pain To wound immortals, or to slay the slain." And so I shall bid you 'Adieu'! The buzzing flies are a nice touch. Can this be added to the smilies gallery? Don't forget to use an obscure expression and misspell a word or two in the Robot's explanation to get the biggest bang for your buck. Which lead to the question: when retiring the space shuttle fleet without ready replacement, was NASA and/or US gov't expecting (or encouraging) the private sector to step up and keep the US viable? Reading on, a link to another article gave an answer: After Space Shuttle, Does U.S. Have a Future in Space? which paraphrases NASA Administrator Charlie Bolden as saying "Private aerospace companies and American ingenuity will drive efforts for getting astronauts into low-Earth orbit"